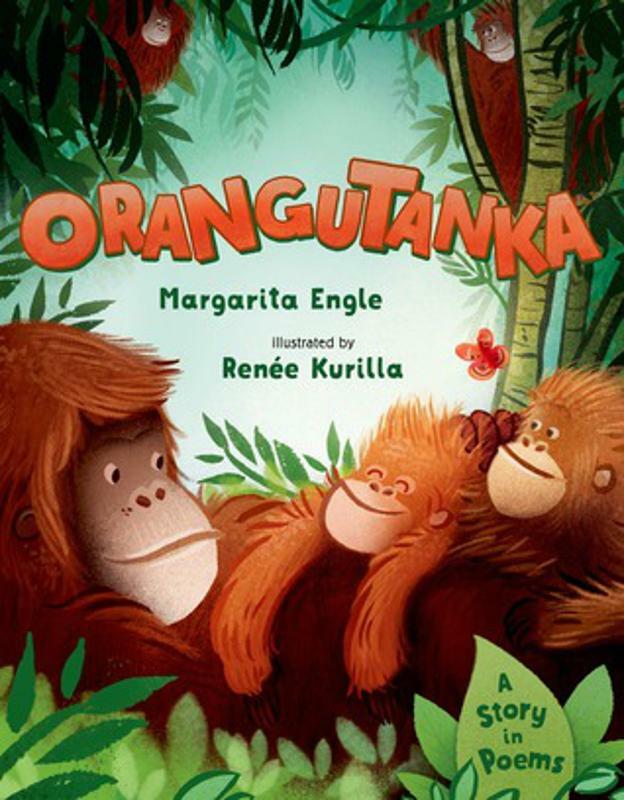 Orangutanka: A Story in Poems (Henry Holt, 2015) is one of the latest works from award-winning author Margarita Engle. Engle, who writes young adult novels, poetry, and children’s fiction, has created an exceptional work in picture book form. Inspired by a trip to a wildlife refuge in the Malaysian section of Borneo, Engle shows these large primates in familiar themes and, at the same time, provides scientific information including their endangered status in a fact section. Engle also invites readers to learn more about orangutans in a bibliography of books and online resources. She invites young readers to try an “orangudance” in the activity page that follows the story. I am impressed with the picture book’s many facets. Engle created a book that contains many elements—narrative, poetry, science, and community-building—within its pages. The illustrations are colorful and inviting. Renée Kurilla, who has illustrated many books for children, combines hand-drawn sketches and ink to lay out each page in a traditional form. The illustrations have strong elements of linear design that relate a sense of the vertical vastness of the rainforest as well as dimension, depth, and texture such as the bark on the trees, the patterns in the leaves and the even thickness of orangutan hair. The leaves, in particular, were combined with digital enhancements from Photoshop to create the shiny, spongy, organic effect. The lines also show movement such as falling rain and the swaying of leaves and the orangutans themselves, as they move about from page to page. Another element to the illustrations is how Kurilla captures the orangutan and relates it to human emotion in facial expression and theatrically in movement. The orangutans’ hands in particular are human-like and Kurilla captures this in many gestures. My favorite is the hands up to the sky. Color is also a dominant feature. The setting is painted in vibrant tints, tones, and shades. Kurilla used harmonizing colors to express the interior of rainforest, but also the time of day and the weather. Bright, cheery greens show the morning hours and as the day grows longer and as the rain begins to fall, the illustrations change to cooler, bluer tones that likewise relate emotion as well as artistic perspective. The rain itself is a key element to the rainforest as well as literal turning point in the narrative. When it stops, the colors appear ethereal, hinting of a warm afterglow and of twilight approaching. Orangutanka belongs in the classroom library as well in a young child’s bookshelf. Cuban-American author Margarita Engle grew up in Los Angeles, but developed a deep attachment to her mother’s homeland during summers with her extended family in Cuba. She is author of many young adult verse novels about the island, including The Surrender Tree, which received the first Newbery Honor ever awarded to a Latino, and The Lightning Dreamer, recipient of the 2014 PEN USA Award. Other honors include multiple Pura Belpré and Américas Awards, as well as the Jane Adams, International Reading Association, Claudia Lewis, International Latino, and MANA Las Primeras awards. Books for younger children include Mountain Dog, Summer Birds, Orangutanka, Drum Dream Girl, and The Sky Painter. Engle’s latest story, Enchanted Air, Two Cultures Two Wings (Atheneum, August, 2015) is a verse memoir about her childhood visits to Cuba. Margarita was trained as a botanist and agronomist before becoming a full-time poet and novelist. She lives in central California, where she enjoys hiding in the wilderness to help train her husband’s search and rescue dogs. Renée Kurilla is an illustrator of many books for kids including Berkley the Terrible Sleeper by Mitchell Sharmat. Before transitioning to a full-time freelance career, she spent 10 years drawing, animating, and designing at FableVision Studios. Renée lives in a little house just south of Boston with her husband, her fluffy cat Timmy, and a forest full of animals. She makes books and also co-blogs on Simply Messing About. Follow her on Twitter and Instagram: @reneekurilla. 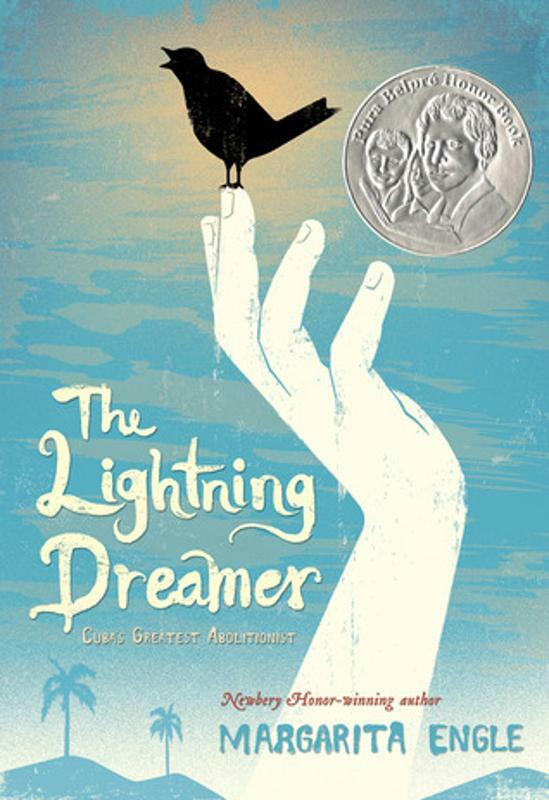 Award-winning author Margarita Engle breathes life into Cuban abolitionist poet Getrudis Gómez de Avellaneda (1814-1873) in her young adult verse novel, The Lightning Dreamer (Harcourt, 2013). Getrudis Gómez de Avellaneda, known as “Tula” to her family and friends, is considered to be one of the foremost Romantic writers of the nineteenth century and one of the greatest of the women poets of that era. She wrote plays, poems, and sonnets in lyrical prose to boldly express her beliefs about the emancipation of slaves, interracial and voluntary marriage, the exclusion of women, and classism within the Spanish colony of Cuba. Engle creatively weaves together fact with fiction to conjure Tula—her voice and her world. by freeing my own heart. Tula’s journey begins with the yearning to read and stealing quiet moments and books from her father’s glass-cased library and her little brother Manuel’s school bag. Interestingly, it is Tula’s mother who becomes her most ferocious opponent and strongest influence in Tula’s poetic narrative. At the convent library, a young Tula discovers the poetry of Cuban poet, José Maria Heredia (1803-1890), the abolitionist-poet and independista who was forced into exile. Though they never meet, Heredia becomes Tula’s invisible mentor and inspires Tula’s wild words to flow. to let wild words soar. Engle narrates Tula’s story through other characters in several first-person points of view—Manuel, her brother and ally, who gives Tula the ink and paper to write her stories, plays and poems; Caridad, the old kitchen maid and Tula’s companion who still dreams of freedom; the nuns whose cloistered convent walls provide a sanctuary of books and the space to compose her poems, plays, and stories; and the orphans who are Tula’s first audience. Tula also finds friendship and love when she meets Sab, the troubled half-African freed slave whose story intersects with hers. Each chapter is titled with a character’s name and each new voice adds an emotional depth rounding Tula’s character and showing her exceptional courage, determination, and transcendence conveyed through the compassion and opinions of character witnesses. From the first page, I heard Tula. Tula’s thoughts, her ideas and opinions are spoken in soliloquy form reminiscent of the stage that served as one of Getrudis Gómez Avellaneda’s political platforms. Tula’s voice is so vocal and her narrative so detailed and poignant that her story reads like a personal interview one might hear on NPR. Engle’s characters effectively create Tula’s world giving the reader a bright glimpse of nineteenth-century Cuba. The novel is broken into five parts and concludes with historical notes about Gertrudis Gómez de Avellaneda and José Maria Heredia and selections from their prose. Margarita Engle is a botanist and the Cuban-American author of Singing to Cuba (Arte Publico Press), Skywriting (Bantam), and The Poet Slave of Cuba (forthcoming from Henry Holt). Short works appear in journals such as Atlanta Review, California Quarterly, Caribbean Writer, and Hawai’i Pacific Review. Awards include a Cintas Fellowship, a San Diego Book Award, and most recently, a 2005 Willow Review Poetry Award. Margarita lives in central California, where she enjoys hiking and helping her husband with his volunteer work for a wilderness search-and-rescue dog training program. E-mail: Englefam[at]Earthlink.net. The children have learned to fly back and forth to school, dangling from steel cables suspended high above the flooded rain forest floor… no trails or roads in this realm of jaguars and guerrilla camps. The children cross chasms and gorges, first climbing cliffs and trees, then rappelling to heights, and sliding along the cables, older children carrying the younger ones in sacks of coarse burlap, like small, helpless creatures being delivered to market. Nameless villages are hidden far below. There are angels in the water. From their place in the sky, children see the white fog and green wildness… it’s a place so familiar that each child in flight accepts an airborne existence as normal… nothing is impossible here, no miracle of daily survival ever seems completely new.